Be a HOSTer ‒ Help Others Grow and Thrive! "Coaching is about improving the individual's capacity to focus, learn, and innovate." Removing Barriers: listening, reducing interference such as fear and doubt, removing barriers to learning, and focusing attention of the player. Challenging: asking coaching questions, inspiring and energizing others the player, helping him to create or think something through for himself. What do you want to achieve? What are your goals? Question Your Assumptions >> Illusion or Reality? The goal of a coach is to bring out the possibilities in a player. Coaching is to guide vision, urge excellence, and empower the one being coached – the player – through establishing a firmer connection with his or her inner authority. Performance of an individual = potential + attitude - interference. 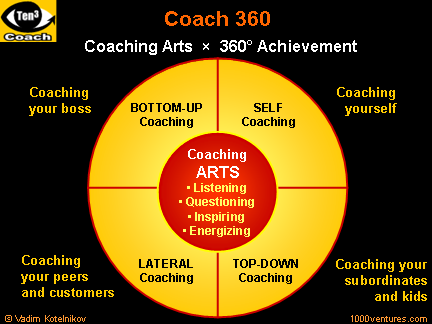 During 1990s, coaching became one of the "hot" areas of personal, professional, and business development. There is in-build limitation in training and consulting, as well as directive coaching that involves directing, telling and instructing, which is the person giving advise or instruction has to know the answer already, or has to be able to work it out. Given the complex structure in most organizations as well as constantly and rapidly changing business environment in today's knowledge-driven economy, that is an unrealistic proposition. 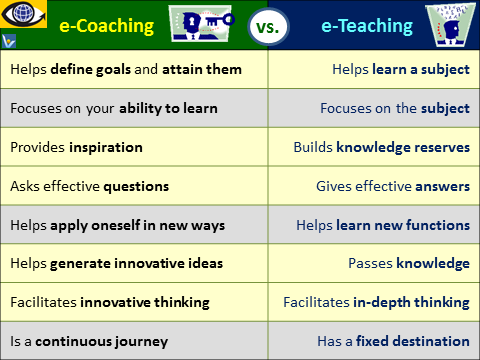 Non-directive coaching that involves inspiring, asking effective questions, summarizing, paraphrasing, reflecting, and listening can help you and the player you are coaching achieve amazing results. If you adopt non-directive approach, people learn in minutes things that would take you, operating from a more conventional directive model, hours to teach. Coaching is the key to unlocking the potential of your people, your organization, and yourself. It is based on the concept that individuals learn most from the everyday application of skills and by trying things out in practice. The coaching is all about helping others to identify and define their specific goals, and then organize themselves to attain these goals. Coaching deals with building an individual's personal skills, from setting the goals, to communication, management style, decision making and problem solving. Coaches draw upon a client's inner knowledge, resources and creativity to help him or her be more effective. It is about bringing the same structure and creativity to your interaction with colleagues as you bring to solving business problems. Source: Harvard Economic Review Executive summary by Anastasia Bibikova. The GROW (Goal, Reality, Options, Wrap-up) model is one of the most common coaching tools. 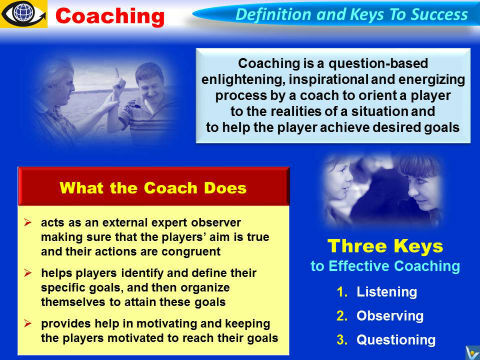 The framework provides a simple four-step structure for a coaching session. Great Faith. Great Doubt. Great Effort. – The three qualities necessary for training. not the filling of a vessel. Coaching is an important part of the good leaders' role. Leaders must seek to develop high value in other leaders below them. everything around you becomes your inspiring coach.